*** Department of Dermatology, Ain Shams University, Cairo, Egypt. Tufted angioma is an uncommon benign vascular neoplasm, localized to the skin and subcutaneous tissues. Half of the cases present in the first year of life. We describe a case in a 34-year-old male who presented with different sized reddish nodules, occurring on multiple hyperpigmented erythematous macules situated on the proximal parts of upper limbs that first appeared three years earlier. 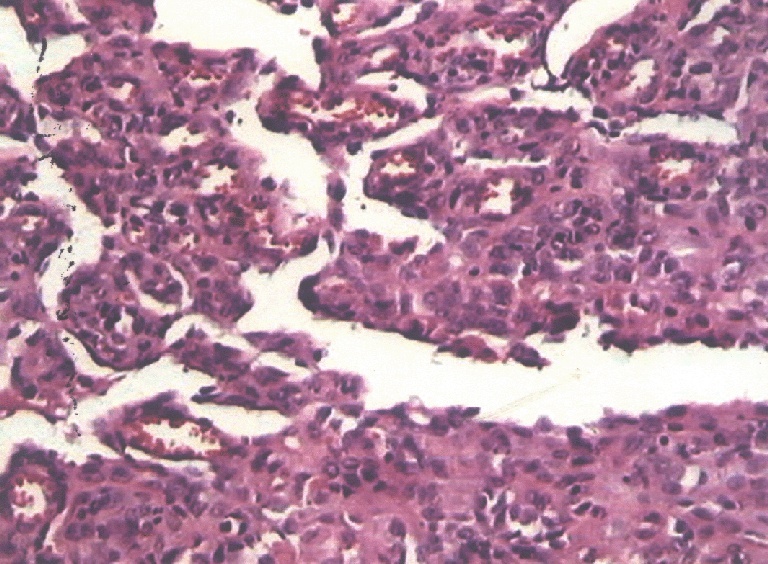 Histopathology revealed circumscribed multiple foci of closely set vascular channels giving the canon ball appearance and were of vascular origin . A 34-year-old male presented with multiple hyperpigmented erythematous macules on the proximal parts of the upper limbs, shoulders, and dorsal aspects of the forearms of 3-year duration. Nodules of different sizes appeared on top of some of the macules. The nodular lesions varied in color from light to dark red and were restricted to the macules, with no involvement of the normal skin. The clinical differential diagnosis included Kaposi's sarcoma, pyogenic granuloma, hemangioendothelioma, bacillary angiomatosis, and angiosarcoma. Two biopsies were taken, one from the macular lesions, and the second from one of the nodules. The first biopsy (from the macules) showed basal cell hyperpigmentation, and dermal cellular infiltrate. The second biopsy (from one of the nodules) showed multiple, discrete, circumscribed dermal foci of closely set vascular channels, with the epidermis surrounding one of the foci in a claw-like manner. The tumor masses appeared as dilated capillary channels lined with spindle shaped infiltrating cells, with no atypia or mitotic figures, and there were RBCs inside the cavities with no extravasations. All tumor cells stained positively with CD34, while factor VIII was positive in some vessels. CBC, prothrombin time, partial thromboblastin time, and coagulation factors, and bleeding time were normal. Reddish nodules, occurring on multiple hyperpigmented erythematous macules. H&E section: tumor masses appeared as dilated capillary channels lined with spindle shaped infiltrating cells, with no atypia or mitotic figures, and there were RBCs inside the cavities with no extravasations..
More than 50% of cases of tufted angioma occur within the first year of life, and of those, 15% are believed to have had a blemish in the area where tufted angioma appeared later, which suggests a congenital mode of presentation. Most of cases (60-70%) of tufted angioma develop before the age of five. Fewer than 10% of cases with tufted angioma are older than 50 years. In individuals older than 60 years, the disease is very rare . Tufted angioma presents clinically as ill-defined slowly progressive dull red, brownish or purple macules or plaques with mottled surfaces. It slowly enlarges over six months to ten years, after which no further growth occurs. Papules and nodules may superimpose on the main lesions as was observed in the present case. The sites most commonly involved are the upper trunk, neck and shoulders, less commonly the face, scalp, and proximal extremities. Rarely does it affect the feet and oral mucosa. Partial regression may occur, but complete disappearance is rare. Hyperhidrosis may occur in the skin overlying the lesion, and when it occurs, it corresponds histologically with an area of abundant collagen. Occasional association of the more serious platelet-trapping syndrome (Kasabach-Merrit syndrome) has been reported, so the presence of petechiae or ecchymotic patches should alert the physician to the development of those complications. Cases of tufted angioma have been reported on the skin of a liver allograft recipient, but regressed after modulation of immunosuppressive therapy. Different modalities of treatment have been tried, including complete surgical excision, soft X-ray therapy, and electrocoagulation. Pulsed dye laser has also been tried without encouraging results. Potent topical steroids have been used to reduce pain. Interferon a2, and high doses of systemic steroids should be tried before proceeding to excision, particularly where lesions are excessive[11, 12]. 1. Alessi E, Bertani E, Sola F: Acquired tufted angioma. Am J Dermatopathol; 8: 426-9. 2. 2. Bernstein EF, Kantor G, Howe N, et al: Tufted angioma of the thigh. J Am Acad Dermatol 1994 31(2 Pt 2): 307-11. 3. Frenk E, Vion B, Merot Y et al: Tufted angioma. Dermatologica 1990; 181: 242-3. 4. 4. Ban M, Kaniya H, Kitajima Y: Tufted angioma of adult onset. Dermatology 2000; 201: 68-70. 5. Jang KA, Choio JH, Sung KJ et al: Congenital linear tufted angioma. Br J Dermatol 1998 138: 12-13. 6. Lam WY ,MacMoune-Lai F, Look CN et al: Tufted angioma with complete regression. Pathol 1994 21: 461-6. 7. Fukunaga M: Intravenous tufted angioma. APMIS 2000 ; 108: 287-92. 8. Enjolras O, Wassef M, Dosquet C, Drovet l et al: Kasabach-Merrit syndrome on a case of tufted angioma. Ann Dermatol Venereol 1998 ; 125: 257-60. 9. Chu P, Leboit PE:An eruptive vascular proliferation resembling acquired tufted angioma in the recipient of a liver transplant. J Am Acad Dermatol 1992; 26: 322-5. 10. Dewerdt S, Callens A, Machet L, Grangepont MC, et al: Acquired tufted angioma with failure of pulsed dye laser therapy. Ann Dermatol Venereol 1998 125: 47-93. 11. Park KC, Ahm PS, Lee YS et al: Treatment of angioblastoma with recombinant interferon α2. Pediatr Dermatol 1995; 12: 184-6. 12. Munn SE, Jackson JE, Fusseel-Jones R: Tufted haemangioma responding to high dose of systemic steroids: a case report and review of the literature. Clin Exp Dermatol 1994; 19: 511-14.